Student Affairs Television Screens offer advertising to Pitt affiliates digital screens in the William Pitt Union, Cathedral of Learning, and O’Hara Student Center. 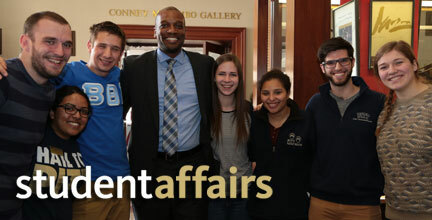 The primary purpose of the Student Affairs TV Screen system is to promote events, programs, and services sponsored by the University of Pittsburgh departments and certified student organizations that enable Pitt students to fully engage in campus life. Click here to submit your content for Student Affairs TV Screens. Be sure to read all of the submission guidelines before submitting. The Division of Student Affairs has sole responsibility and authority for approval and posting of all content on the digital signs in the William Pitt Union, the Cathedral of Learning ground floor, and the residence halls. Content must directly support the mission, vision, and values of Student Affairs, as well as the purpose of promoting University of Pittsburgh events, programs, and services. Content depicting violence or weapons, sexually explicit material, illegal activities, alcohol, or profanity will not be permitted. All content must clearly name the sponsoring organization. Sponsoring organizations or departments may have a maximum of two (2) submitted items running on the screens at any given time. There are two types of content that can be displayed: slides or videos. Content must be designed in a professional manner. The submitter accepts responsibility for the accuracy of content, and that they have appropriate permission to use any copyrighted material (if applicable). We can not display videos or slides containing copyrighted material. Student Affairs reserves the right to make editorial and format changes for all submissions. Videos will not be displayed for more than three weeks. Slides will not be displayed for more than one month. Flyers must be submitted as a JPEG and MUST have a 16×9 aspect ratio in order to maximize the horizontal dimensions of the TV screens. Videos may be submitted in either standard or high definition, must have open captioning, and be in the .mov or .mp4 format with audio levels reaching no more than -6dB. Videos may not be longer than 60 seconds in length. File names should end with the date that you would like the file removed. For example, a file being removed September 15 might be named “Event Title_Sept 15.jpg”. To guarantee that content is displayed during your requested time, items should be uploaded to the Pitt Box service on the TV Screen webpage at least one (1) week in advance of the requested posting date. If you have any questions please send an e-mail to sjg84@pitt.edu or call Samantha Gatesman at 412-383-2122.